Today’s recipe is easy and short. 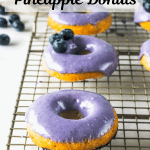 We are making these Blueberry Pineapple Vegan Donuts. 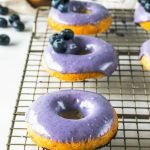 This is a super easy vegan donut recipe. We use crushed pineapples in the batter, and also fresh blueberries. I was looking for an easy vegan breakfast recipe the other day, since I have transitioned into eating mostly vegan in the past couple of months. Actually, I have dairy or eggs in baked goods sometimes, but I have cut out cheese, milk, eggs, and anything like that out of my diet otherwise. It’s a little bit harder if we are eating out, as most places don’t offer vegan options, and my family isn’t vegan at all. My husband and son love their meat. Plus, there aren’t many vegan spots around where I live. I am 100% vegetarian though, so I won’t budge on that one. 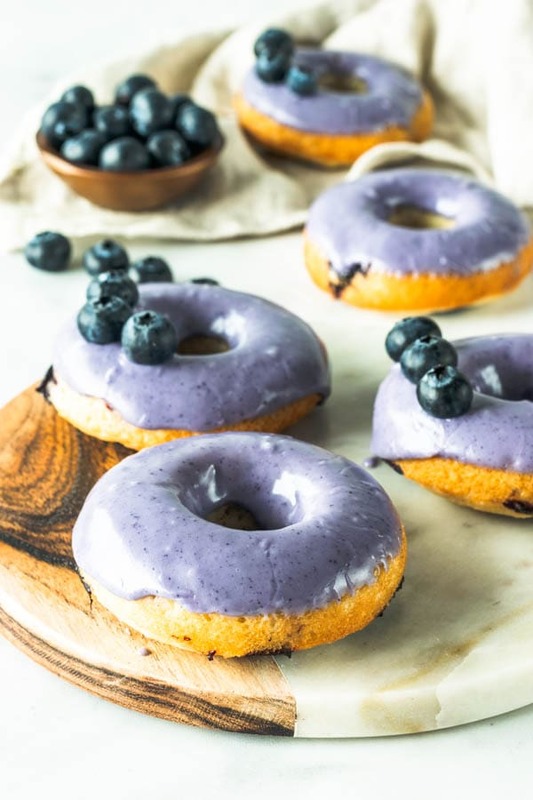 Ok, now let’s talk about my Blueberry and Pineapple Vegan Donuts once and for all. 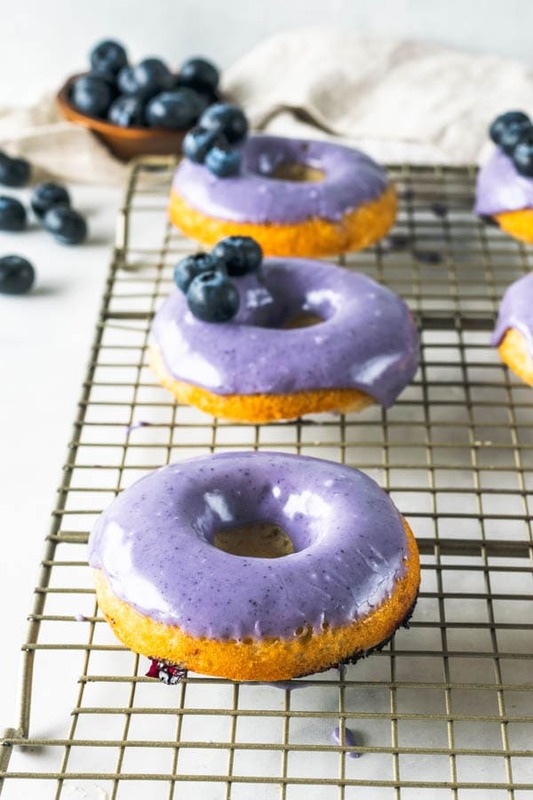 These Vegan Donuts are super easy to make. It will take you about 10 minutes to put this batter together. Give it 10 more minutes to bake, and in about 20 minutes you can have fresh out of the oven delicious vegan donuts. 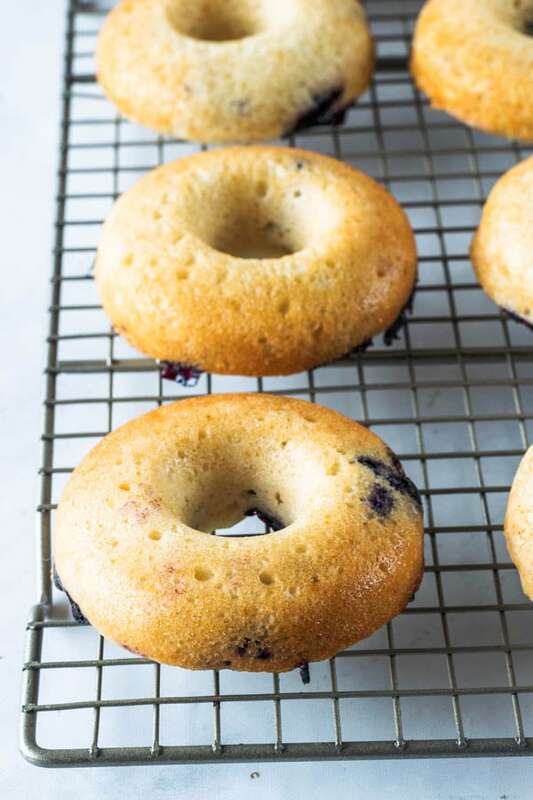 The blueberry glaze on top only takes 2 ingredients: blueberry jam, and powdered sugar. I like to strain the jam to make the glaze smooth. You can go ahead and use store-bought jam, or use the recipe down below to make your own homemade vegan blueberry jam. If you don’t want to make blueberry jam, and you don’t have any store-bought jam around, you can always puree some blueberries in the food processor, strain them, and use the juice to make the glaze. And voila! 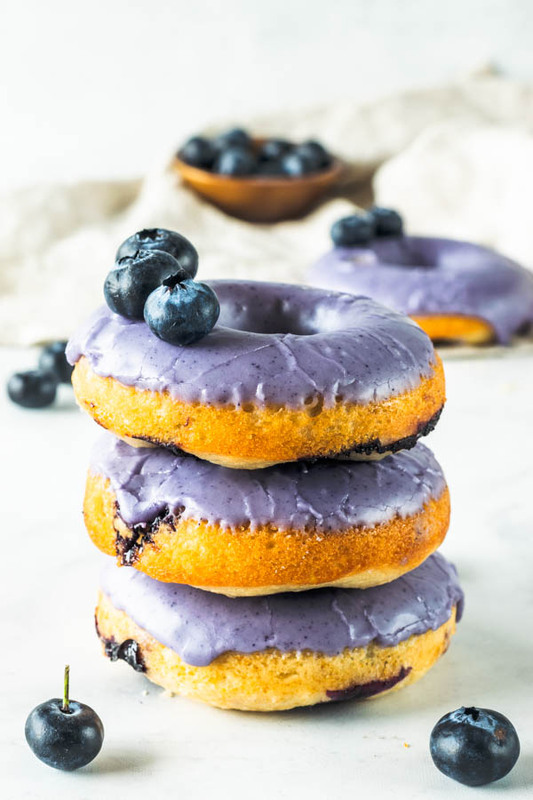 Dunk those vegan donuts in that delicious blueberry glaze, and enjoy! This is my first vegan donut recipe on the blog. I have a few other donut recipes but they aren’t vegan donuts. These are from the beginning times of my blog. 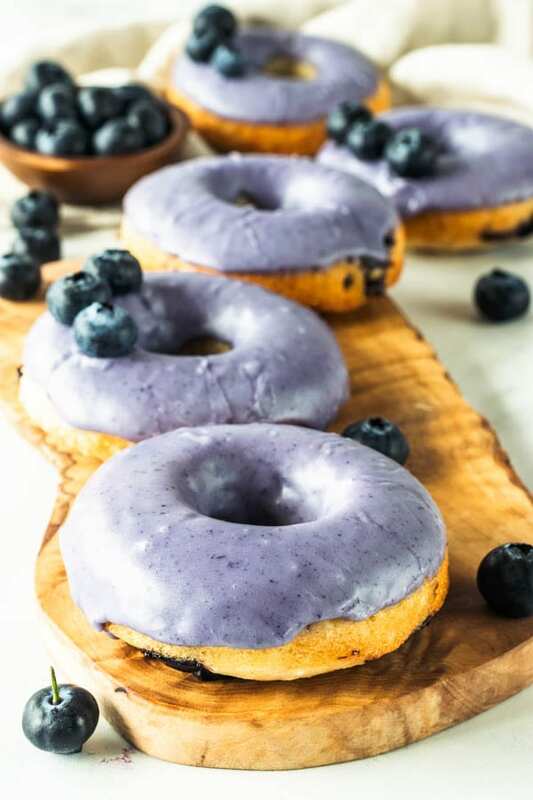 If you like these Blueberry Pineapple Vegan Donuts, you might want to check out some more of my Vegan Dessert recipes. Thank you for reading. 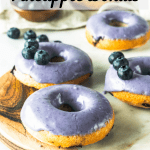 Today’s recipe for this delicious Blueberry Pineapple Vegan Donuts is as easy and quick as this post. I hope you enjoy it. 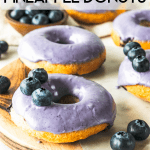 These Blueberry Pineapple Vegan Donuts are easy to make, will make for a delicious breakfast, or afternoon snack. You won’t be able to eat just one! Mix flour, sweetener, baking powder, salt. Set aside. Mix crushed pineapples, almond milk, melted coconut oil, and vanilla extract. Pour batter onto greased donut pans. 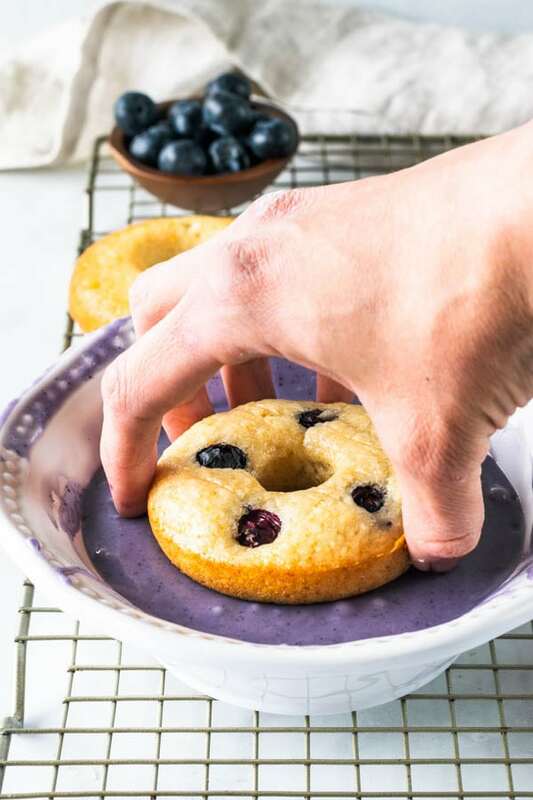 Place blueberries on top of donuts before inserting them in the oven. Remove once donuts are lightly golden. Let donuts cool before proceeding with the glaze. Mix powdered sugar and blueberry jam. Dunk donuts into glaze, or simply drizzle glaze over donuts. Donuts are best served on the same day. They will keep well in the fridge for 1-2 days. *Use strained blueberry jam if you want a smooth glaze. You can also simply puree a handful of blueberries in a small blender and strain them if you don’t want to use jam. **This blueberry jam recipe will make way more jam than you will need for this recipe. If you choose to make your own following this recipe, you can store the jam in the fridge for up to 5 days, covered. Use it on toasts, or oatmeal bowls, etc. Que combinação fantástica, deve ter ficado muito gostoso!!!!!!! ficou sim!! Queria que voce experimentasse, pai! I love baked doughnuts and this recipe sounds truly divine. The colour of that glaze is stunning too.